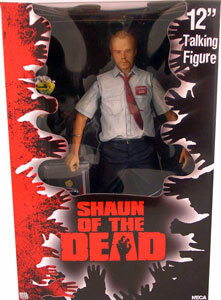 Description Of Item: Shaun of the Dead 12-Inch Action Figure with Sound. Come and get it! It's a talking figure! All you can buy! Have some flesh-eating fun with one of the best selling and most popular cult classics figures to date gets the deluxe treatment in the 1:6 scale format. Shaun comes complete with his cricket bat and base as well as an interchangeable left hand with flower bouquet. The figure also "speaks" key phrases from the film.